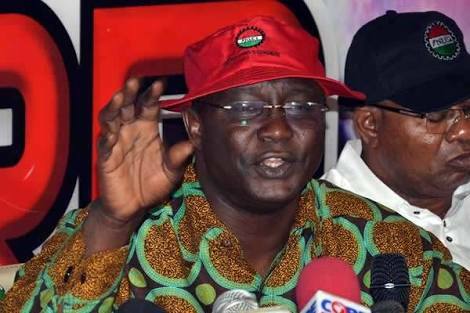 Nigerian workers' umbrella union, Nigerian Labour Congress (NLC) has said it will not to allow the Tripartite Committee for National Minimum Wage to alter the time line for the implementation for the new wage. Their position was made known by NLC President Ayuba Wabba at a Pre-May Day Symposium organised by the NLC and the Trade Union Congress (TUC) in Abuja. The Federal Government, which raised a wage review panel in November last year, promised to implement the new national minimum wage for workers from the third quarter of the year, based on the recommendation of the committee chaired by a former Head of Civil Service of the Federation Ms. Ama Pepple. Wabba said: “We will make sure that the time line that has been set by the tripartite committee for the implementation of the national minimum wage will not in any way be altered or undermined. “Workers, who create wealth, must also be well taken care of as we are not unmindful of the situation of the Nigerian workers, particularly, with the increasing inflation in the land. Speaking on today’s celebration, the NLC president described May Day as an opportunity to provide workers better policy and address issues affecting them. Wabba said workers must be prepared to demand for a better working condition and welfare. He said: “Importantly, we are going to interrogate how far the democratic process has been able to deliver on its mandate and how workers have being fairing. The Nation reports that he urged the government to address the issue of governance, inequality gap, unemployment and development among others. Prof. Onje Gwardo, Faculty of Law, University of Jos, called for commitment among workers in the discharge of their duties. He urged them to show commitment to work, ideas and national development. In his goodwill message to the workers, Senate President Bukola Saraki yesterday hailed the resilience, dedication and contributions of workers to national growth. Telecommunications solution provider, Globacom, also identified with the workers and commended them for their uncommon industry, abiding resilience and unimpeachable patriotism. In a statement by his media aide Yusuph Olaniyonu in Abuja, Saraki described workers as the mainstay of the economy. He called on the workers to continue to put in their best in any sector they find themselves, saying that their efforts shall never be in vain.